I was tasked with leading a responsive redesign for the Twitter Official Partners website. Our internal client sought to increase awareness, traffic and SEO on the site as well as showcase their partners innovative Twitter services and products. 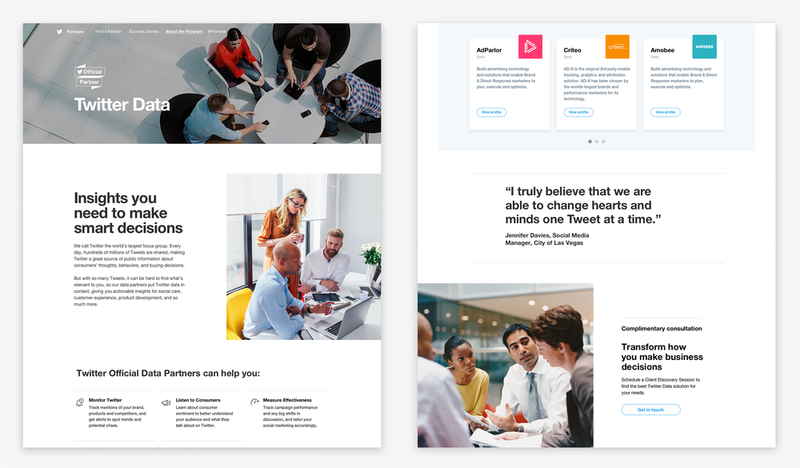 I worked with strategists to establish user flows and site architecture; and went on to reimagine the UX and visual design– creating an on-brand, premium experience that was able to revamp the existing design system and cater to the needs of Twitter’s B2B audiences. In addition, I lead client conversations for UX and UI, art directed photography, and managed design expectations for vendors and internal creatives.